The Manawatu that the first European had to come to terms with was one which hand only recently experienced an major upheaval. The Manawatu that the first European had to come to terms with was one which had only recently experienced a major upheaval. For several centuries previously, it had been the home of the Rangitane people. These people had moved into the area and replaced the Ngati Ara and Ngati Mamoe. By 1800 the Rangitane controlled the land in the Manawatu while to the south the Muaupoko resided around the beauti­ful lakes of Horowhenua and Papaitanga. The island of Kapiti was inhabited by the Ngati Apa. The upheaval was to come in the form of Te Rauparaha, his Ngati Toa people, and their kinsmen the Ngati Awa of Taranaki. The story of the Ngati Toa migration from their Kawhia home and consequent subjection of the Manawatu-Horowhenua region is told fully by T.L. Buick in "Old Manawatu". (1) After assisting the Ngati Toa in their conquest many of the Ngati Awa returned to their homes in Taranaki. To rebuild his numbers Te Rauparaha sent for the Ngati Raukawa, of whom he was also a chief, to join him from their Waikato home. From his new home on Kapiti Island Te Rauparaha transferred the mainland areas he had conquered to his followers. The old Muaupokoo land became the possession of Te Whatanui, the lower Manawatu came into Te Whetu's ownership and the Rangitikei areas became the domin­ion of Nepia Taratoa and his people. Te Whetu had married a Rangitane woman, Hene-titi, and went with her to the settlement of Te Iwi Te Kari, near Foxton. Taratoa's influence seems to have extended to the lower reaches of the river for in "Old Manawatu" there is a report of a meeting between Taratoa and Jerningham Wakefield at Manawatu. Buick quotes Wakefield as saying he afterwards spent days with the chief at his various residences. (2) The major marae in the area that was to become Foxton was at Matakarapa. The site across the river, Te Awahou, now known as Foxton was occupied by Ihakara Tukumaru and his Ngati Ngarongo and Ngati Takihiku people some time during the 1840s. Ihakara was to become the dominant figure in the area and was a major influence in the shaping of the European settlement of Foxton. While Duncan was struggling with his mission at Te Awahou the principal European settlement of the Lower Manawatu at Piaka con­tinued to develop. The Kebbell brothers, John and Thomas, had erected a mill in 1842 which was used to process the timber that grew along the riverbank. From their jetty small coastal ships carried loads of pota­toes, sheep, pigs, cattle, timber and flour (processed in an addition to the mill) to the settlers in Wellington. Others living in the vicinity were. T.U. Cook, Charles Hartley, Thomas Bevan, George Nye, Frank Abel, James Nash, Robert Nankevill, William McDonald, Thomas Scott and William Barnett. Cook had moved some of his trading activities down­stream to near Duncan's mission station by 1854. Thus the scene was set for permanent European settlement on the site eventually to be known as Foxton. In 1855 the southern areas of the North Island were shaken by a major earthquake, usually referred to as the Wellington earthquake. The effect on the settlement at Piaka was devastating. Buildings were destroyed, the most notable being the Kebbell's mill. The settlement was split up. The Kebbells went south to Wellington, although John later moved on to Ohau. Many of the others moved into Te Awahou and became part of the tiny village with Cook's store and jetty as its focus. From about 1857 the Te Awahou settlement was referred to as Man­awatu by many and in 1858 the survey of the Te Awahou Block by James T. Stewart, assisted by W.N. Searancke, gave the first detailed survey of the locality. (see map). Although the new Te Awahou Block purchase was a relatively trouble free one this did not hold true for the rest of the Manawatu. The story of these purchases is well documented in Buick's "Old Manawatu". As far as the development of Foxton is concerned their main effect was to hold up the development of the Te Awahou Block for settlement until 1866. During the early 1860s life in Te Awahou, if not at a standstill, certainly went through a hiatus. Although Stewart's survey was com­pleted in 1859, and the purchase from Ihakara and his people settled soon after, the actual sale of sections did not take place until 1866. Duncan and Cook both had land claims that they continued to occupy within what was to become the Borough of Foxton. In the meantime the potential of the Manawatu area was a subject of speculation. In 1859 the "Wagga Wagga" was the first steamer to travel up the river and the reporter recording this in the Wellington Independent hoped that "the General Government will purchase the district from the natives". Land in Te Awahou was in the headlines when Duncan's holdings were ques­tioned by Octavius Hadfield of Otaki, Anglican Bishop of Wellington. The squabble did little for the reputation of either churchman and as well dragged Ihakara's standing into doubt. But land was, and still is, a focus of contention in the New Zealand society. Life continued in Te Awahou with children born, stock lost in river crossings, property lost in floods and fire, bush race meetings held, travellers passing through, settlers and Maori dying. The most notable of the latter to pass on was Nepia Taratoa (in 1863) and his mana passed on to Ihakara Tukumaru. Everything was not all peace and quiet in Te Awahou and in fact it was suggested in 1863 that the settlement might be abandoned. The reason was rumours that an attack by supporters of the Maori King was likely. In response a meeting was called at Te Awahou to set up a militia group. Prominent at the meeting were H. Symons, W. Wintersgill, T.U. Cook, G. Trask, C. Symons, B. Smith, and A. Gray. The feeling of the meeting was that to leave the area would result in the Kingites claiming the land back by right of conquest. Most of the local Maori were considered "loyal" but if the Kingites attacked they would probably join them for their own protection. The attack did not eventuate and perhaps just as well for the stockade built (in what is now Duncan Street) to supplement the defences afforded by Liddell's store, was not afforded a water supply! Commerce continued with ships such as "Alert" and "Kate" trading between Wellington and the Man­awatu. The 1866-67 New Zealand Almanac records Manawatu as being the home of five storekeepers, three bootmakers, two carpenters, a hotel keeper, a ferryman, road overseer, fours surveyors, nine farmers and settlers and four labourers. TOWN LOTS IN THE TOWNSHIP OF MANAWATU, situate at Te Awa Hou, the present landing place for goods, about three miles from the mouth of the River. These sections will vary from a quarter acre to one acre. A FEW TOWN LOTS IN THE TOWNSHIP of MOUTOA, about twelve miles above the Manawatu Township, and also on the river. SUBURBAN AND SMALL FARM ALLOTMENTS, in blocks varying from 2 to 100 acres. The blocks are adjacent to the two Townships, and are also laid off on either side of the road now in progress to connect the Moutoa with the Manawatu Township, and on branch line of the road. TIMBER SECTIONS (as many as can be surveyed will be offered for sale) - about 18 miles above Moutoa, laid off on either side of a road now in progress to give access through the bush to the navigable por­tion of the river. These sections will vary from 100 to 320 acres, and several of them will have river frontages. A Township will be laid off at a suitable place on this line of road, which will be a connecting line between the Rangitikei and the river navigation, through the open and bush country of Oroua and Upper Manawatu. The River Manawatu has a depth of water on the bar varying from 9 to 12 feet, and is navigable for vessels of that draught for nearly 40 miles (by the river) from the mouth. The timbered sections to be offered for sale form the extreme end of a rich flat block of forest land of great extent (about 60,000 acres) a considerable portion of which is covered with the finest totara timber. The road through these sections opens up the extensive plains be­tween the Rangitikei and the Manawatu to the River, which is the natural and only outlet of that district. This road will also form part of a line of inland road from Wellington to Wanganui. Cobb and Co's coaches will, after the 15th December, 1865, run at least twice a week between Wellington and Manawatu, and every in­formation can be obtained from the Survey office at Manawatu by intending purchasers. Lithographed maps, showing the position of the lands to be sold, will be immediately prepared for sale to the public; and as soon as possible, before the sale, a map with full particulars of the sections of land for sale will also be published. A further notice will be issued giving the day on which this land will be offered for sale, and full particulars as to the upset price, size of lots, &c, will be published. But sales were delayed a further twelve months due to delay in completing the survey. This does not seem to have influenced the "Inde­pendent" for in February 1866, when comparing the Manawatu with the Wairarapa for settlement, claimed "The River Manawatu, however, is a highway ready made, and the steamers which will ere long traverse its waters, will cheaply convey the produce of the district either north or south, as openings may present themselves. The district presents a fertile soil, fine and abundant timber, and ready means of access, to within, at most, a few miles of every spot therein." Settlement of the Manawatu was viewed as a way of easing the pressure on Wellington and facilitate an increase in population. A further report in the Independent on 5 April 1866 shows that the tiny settlement of Te Awahou was not without its moments. When the Ngati Whakatere and Rangitane met Superintendent Featherston to de­cide the boundary between their lands, in the Court House at Manawa­tu, the waipiro (spiritous beverages) took its toll. Before the meeting could begin a disturbance occurred among a large number of "natives" who had indulged freely at a neighbouring public house. Featherston, closed the Court House and summarily cancelled the "Bush" licence of the Adelaide Hotel! However, the auction of the sections in the township of Foxton did take place in November 1866. The Evening Post of 6 November reported that the auction offered "… most eligible investments for capitalists ... Foxton contains the port of shipping for the large inland district . . . old colonists have looked forward to the day when the rich plains of the West Coast could be in the market and we doubt not that ... attended ... by many country settlers in. addition to reps of several mercantile firms of the city." The upset prices set for the land were: Town sections (2 roods) - 15 pounds; suburban (1 acre) - 10 pounds; rural (44 or 100 acres) - 1 pound an acre. Those who already occupied sites could claim the value of improvements if their sites were purchased by another. Among those who purchased sections were Robert Kirk, Wm. Louden, Francis Robinson, John Knowles; Gibbs Jordan, George Snelson, Alexander Gray, Dr Batten Smith, J.T. Stewart, Henry Wilson, Wm. Wintersgill, Geo. Nye, James Duncan, and Joseph Trask. By now the obvious question is why rename the settlement Foxton. This is not an original name for there is a village of that name in southern England but that is not the origin in this case. In fact the name was chosen in honour of Sir William Fox, a colonist from the earliest days of European settlement. His home was at Greatford, north of Bulls, and in fact his house "Westoe" still stands. He had at the time of the Manawatu surveys been Prime Minister in 1856 and 1861-62 and again served in that position in 1869-72 and 1873. 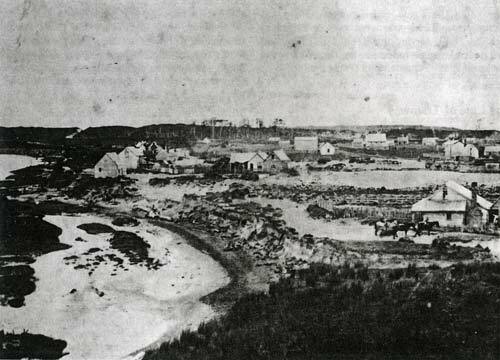 During 1867 the new township was a hive of activity as the physical needs of the settlement were developed. A church was built by the Presbyterians and the Rev Duncan continued to preach there for many years. He became a leading figure in the development of the Presbyte­rian Church in New Zealand and a prime mover in the Union of the Northern Assembly and the Synod of Otago and Southland. His church still stands but today is utilised by the Foxton Little Theatre. Among those who were building new homes on the recently acquired sections was Alexander Gray, an already established businessman. The Welling­ton almanac of 1867 contained advertisements from Alexander Gray (storekeeper), Mrs L. Burr (Adelaide Hotel), William Barnett (White Hart Hotel). The 1868 edition also had advertisements from Gray, Hen­ry Brown (confectioner), C.H. Symons (butcher), and John W. Liddell (storekeeper). The first local body in the Manawatu, the Foxton High­way Board, was established in November 1867. At a meeting of the ratepayers held in the Mechanics Institute in January 1868, a Board of Wardens was elected. Members of this were George Nye, Wm Loudon, Wm. Wintersgill, Charles H. Symons and F. Robinson (chair). Soon after John Purcell was appointed collector of rates. In 1869, a new courthouse was constructed and became a focus for land and criminal hearings. The next few years saw many new businesses, organizations, and committees set up. One important part of life was the stage coach which had, since the eighteen forties, travelled along the beach en route from Wellington to Wanganui. The ferry house at the river mouth had been an overnight stay for the travellers. However, it was not long before the new township of Foxton wanted its share of the action and in 1868 the following petition was presented to the Superintendent of Wellington Province. We the undersigned settlers of Foxton, Manawatu, beg most respect­fully to draw, your Honour's attention to the carrying out of the follow­ing plan as conducive to - not only the advantage of the immediate district in which its benefits will be directly felt - but also by increase of trade and development of unsold land, actually benefiting the pro­vince generally. We would show that at present "Cobb" coaches arrive at the mouth of the river Manawatu not only to the inconvenience of the Foxton settlers but also to the increase of expenditure on the part of the Contractors by an extra Mailman, and does not in its entirety, carry out the subject of the subsidy in opening up the Country as much as possible to occupiers and intending purchasers of land. We enclose a sketch plan, and do show we think, most forcibly that its advantages are obvious. You will observe that Point A is usually accessible direct and conse­quently used as the shortest "turning in" place to the Manawatu village. The Ferry B as per scale of plan is exactly 4 3/4 miles from the beach and the road through at present not all that could be desired would by a very little and not very expensive use of money be equal to many on the coast. We show as the greatest objection that interested Cavilliers would point out sand hills marked in blue with a cross: it is a shifting sand, but is so small extent that a few pounds would be the utmost necessary expenditure, in fact the whole improvement of the present proposed road would not exceed the sum of 150 pounds. Of course if it occurs how does this effect the corresponding line of coaches to and from Wanganui, but we think we can satisfactorily prove that the benefits are greater than the disadvantages. We would show that 2 1/2 miles are necessarily added to the present distance but as the said distance is, comparatively, for a full days journey but a short one - and as the coach can easily arrive at Langleys by 3 or 4 o'clock at the outside and must be more convenient to passengers to have a small town to see and perhaps speculate in than watch the tide coming in and out at the mouth, and wonder how many passengers the Wellington coach will contain. Our strongest bias for now considering the carrying out of this plan is that eventually it will have to be done as the road marked red shows a direct line to Palmerston and Rangitikei districts, and will, be there is no doubt, ultimately be not only the shortest but positively the only West Coast route. We mention that the same also forms the highway to Napier on which provincial money has already been expended and which the colonists have not only extensively used but the surplus stock of Napier has already enriched the coast mentioned. We cannot help but feel we have a claim on the Provincial Govt to do all in their power to forward our interests, as we, that is to say the purchasers of the town sections especially, paid good prices for our land thinking that (in vulgar parlance) it was the wish of your honour to see the place "go ahead" and knowing the deep interest you take in all that concerns us, do not think that you would wish us to apologise for now addressing you. It is hardly necessary for us to remind your Honour, how increased local trade through the medium of this river would be, naturally, enlarged Provincial Revenue. This petition was signed by some 60 inhabitants including Thomas U. Cook (who probably wrote it), Alexander Gray, Charles Ederby, John Alexander Cameron, James Siddell, C.H. Symons, W. Barnett, John Staff, Albert Wood, S.C. Hartley, G.E. Trask, Ihakara Tukumaru, John Knowles, Ernest T. Thynne, Amos Burr, Richard Taylor, Henry Wilson, Harry Elkins, John A. Smith, John Carter, - Osborne, John Wood, C. Parker, F. Robinson, John T. Dalrymple and John Kebbell Jun. With this petition answered, the commercial activity in the town increased and Foxton's importance as the focus for West Coast trans­port systems was enhanced. But apart from this function as a gateway to the Manawatu region there was little other activity upon which a budding town might be based. Flax resources abounded in the area but for many years no efficient method of preparing the fibre by mechanic­al means had been developed. However, in 1868, one James Pownall, an Irishman with experience in the textile industry, visited the Manawatu. The Wellington Independent in October 1868 reported that Pownall "is now at Manawatu, where he intends to commence operation, and we shall be glad to hear that he has not only been able to turn out native flax into a profitable article of export, but also into those coarse fabrics which are always in demand for the packaging of our pastoral and agricultural products." Pownall did, in 1869, establish the first flaxmill in Foxton and for the next century the town and flax production became synonymous. A matter of interest was that Pownall's mill stood on a site very close to that of Foxton's last flaxmill, now the Foxton Fries plant. Although flax was to become an integral part of the town's survival and growth it was by no means a constant friend. The demand for the fibre fluctuated and the mills of the district were want to close and open with the rise and fall in prices. The official recognition of Foxton's position as the gateway to the Manawatu was given when the Govern­ment took over Cook's wharf in 1871. In the Independent of 8 March, 1870, a "Correspondent" reported that "There are over fifty houses situated close together in the town itself, with a fine building for the Scotch kirk, a courthouse, schoolhouse and an athenaeum, also a post office. Without the town proper is situated the Manawatu flax mill, one of the best, I believe, in the colony, not only in the manner in which it turns out its material but in the excellence of the arrangement - the plant being complete. It has its own wharf with tramways running to the different sheds and stores, and every contrivance is in place to save manual labour." The growth of the settlement in the next few years was closely connected with the settlement of the Upper Manawatu based on the township of Palmerston North. The arrival of 51 Norwegian immig­rants on the "Luna" at Foxton on 14 February, 1871, began the influx of settlers. Most of these had to spend some time at the Immigration Barracks in Foxton before proceeding to the new homes in the interior. Thus Foxton truly became the "Gateway to the Manawatu" and before long (1873) a wooden tramway was built to link the port with the rapidly growing inland settlement. The tramway, and the railway that replaced it in 1876, ran down Park Street and along Main Street to the station outside the Post Office site. The first lease of the tramway was held by T.U. Cook and horse drawn carriages conveyed goods and passengers. The influx of migrants, development of the railway links inland, im­provement of wharfage, and building of flax mills saw Foxton grow as a commercial centre. In 1874 the Bank of New Zealand set up in the town and provided services to the locals and the newly arrived settlers of the Manchester Block (now Feilding). The first Local Board for the town was elected in 1875 and comprised J.W. Liddell, Dr Rockstrow, A.J.Whyte, F. Loudon, and T.U. Cook. Further evidence of the town's growth came in 1876 when the All Saints and Methodist Churches were built in Main Street. The provision for the other form of spiritual comfort was extended with the building of Whyte's Hotel in the same year. Local government took a step forward in 1876 when the Provinces were abolished and counties were set up in the rural areas of New Zealand. The Manawatu County was established and had seven ridings including Awahou. The councillors from the riding were E.S. Thynne and J.W. Liddell and Thynne was elected as chairman. The next meeting was held in the Athenaeum, a privately owned hall in Foxton. The county leased premises in the town until its constructed its own offices in Liddell St in 1881. This was used until 1887 when with changes in the County boundaries Sanson became the geographic centre. The establish­ment of the Manawatu Herald by Messrs George and John Russell in 1878 gives further evidence of the growth of the settlement. At this time the major export through the port was timber, the product of the widespread clearing going on in the Upper Manawatu. Excitement was created with the grounding of the "Hydrabad" on Waitarere Beach. The many attempts to refloat the vessel and their failure gave Foxtonians many days of interest. Eventually the salvage of material from the wreck was carried out by Foxtonians and the bowspit and a cannon remained as landmarks in the town for many years after. The building of a new Post Office (on the southern Main Street-Wharf Street corner) in 1879 and a new Court House soon after gave the town an official stamp of approval. Organisations began to flourish, a rowing club in 1879, a rugby club in 1880, cricket continued to flourish, dramatic groups visited and entertained and a second bank (the Australasia) was built in 1880 by when the population had reached 733. In 1881 the railway deviation and port reclamation gave the town a much altered appearance. The focus of the town moved towards the river side. The wharf and railway yards became the centre of activity and provided the town with its focus for many years to come. The move aimed to put all the facilities clear of floods which had become clearly necessary after the flood of 1880 severely eroded the riverbank from Duncan's Corner to Herrington and gave the locals the spectacle of Robert Robinson's house floating past the wharf! Like the rest of New Zealand, Foxton was badly affected by the depression of the eighties and this indirectly was to spell the beginning of the end of the town's importance as a railway centre. Although the Government had begun to build a rail link from Wellington to Foxton, funds ran out and when building restarted, it was by a private company whose landholdings further inland saw the line link with the Foxton-Wanganui track at Longburn. The construction of the Sandon Tramway (1884-5) expanded the area directly linked to the port but not to an extent that prosperity would follow. In its issue of 6.8.1884 the Manawatu Standard noted that the Foxton paper had dolefully remarked "If we can only live long enough to make a borough of Foxton yet". The issue of three days later observed that a four room cottage was knocked down for 50 pounds and another for 21 pounds and commented: "We hope Palmerston North will never come to this"! But there was some progress for businesses were set up (e.g. a co-operative bakery) and a band established (surely a sign of status!). Rumblings of Foxton's separation from the county were discussed at the County meeting in 1886, the year of the opening of the Wellington-Manawatu railway. The shifting of the County Office to San­son in 1887 appears to be part of the pressures that were leading towards the establishment of a borough at Foxton. 1. Buick, T. L. P. 34-109. 2. Buick, T. L. P. 126. 4. Manawatu Herald August 1894.